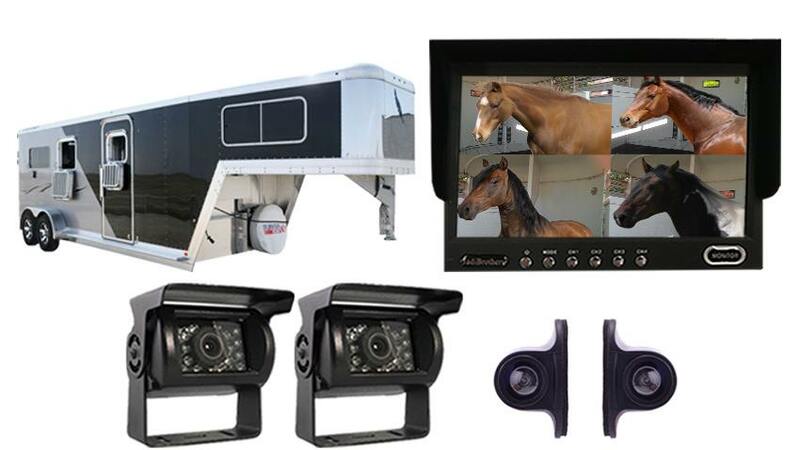 The Tadi Brothers 7" Ultimate Horse Trailer Backup Camera Surveillance System offers a specially designed four-camera set-up to provide the ultimate system for safely transporting your horse. One internal camera, one backup and two side cameras enable you to directly monitor the horse and surroundings. With the internal camera, you’ll be able to see right inside the trailer and get a close-up view of your horse for total peace of mind. A second camera can be used as a hitch or a camera, allowing you to back up and navigate with confidence. All four cameras offer a panoramic 120° viewing angle, are completely waterproof, and adjust automatically for highest resolution night viewing. You can mount the side cameras in the direction you choose to provide the maximum in secure navigation. And the unique compact size of our side cameras ensures that they won’t get knocked off when you have to drive through those really tight spots. When it comes to durability, adjustability and night vision clarity, TadiBrothers cameras are unsurpassed. Harsh sun glare and pebbles are no problems for the RV Box Camera, which is protected by a metal sun shield visor. Our most durable camera, this model has been regularly used on industrial-sized caterpillar trucks that are able to withstand the harsh oil sand of Canada. It even holds up and goes on working after a direct hit from a rock! All cameras connect to a 7” monitor to provide a broad, full color view from each camera. The lightweight, high-resolution monitor contains four video inputs so you can connect multiple cameras, or even a DVD player or game system. Take your choice of viewing one camera, or all four on the crystal clear monitor with split screen capability. You can switch by simply touching a button, or use the convenient remote control. Mount it on your windshield or dashboard (mount included) and power it up easily by connecting to a cigarette lighter or any power source. With the Tadi Brothers promise, you always have our 30-day guarantee to return the item for an exchange or a full refund. Buy with confidence. Our tech team is available 24/7 and we stand by our products 100%.Order your 7" Ultimate Horse Trailer Backup Camera Surveillance System today.